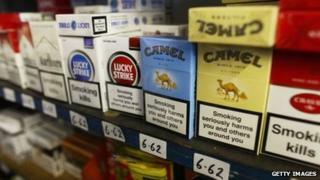 A ban on showing tobacco products at the point of sale in small shops across the UK has come into force. The display of such goods has been illegal in large stores and supermarkets since 2012. Now small stores, and other outlets such as pubs and clubs, will also have to keep cigarettes out of sight. The ban has been welcomed by campaign group Action on Smoking and Health (Ash), but criticised by shopkeeper group the Tobacco Retailers' Alliance. Hazel Cheeseman, director of policy at Ash, said: "Two-thirds of smokers start before the age of 18, so it is vital that everything is done to put tobacco out of sight to protect future generations. "The display ban in small shops will work hand in hand with standardised packs, which will be introduced in May 2016, to further protect children from glitzy tobacco packaging." But Suleman Khonat, spokesman for the Tobacco Retailers' Alliance, said: "The introduction of the display ban into larger shops hasn't even been evaluated, so how do we know it will work in smaller shops? "Of course retailers will need to comply with the law but this is a further unnecessary measure that will hit small businesses."